It’s been hot on the east coast. Like really, really hot. 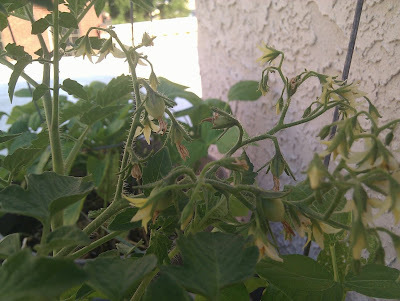 A week or two ago I started to see blossoms on my cherry tomato plants. Then I saw the flowers fall off leaving nothing in their wake. Blossom drop is apparently associated with a few different things, including excessive heat or overwatering. 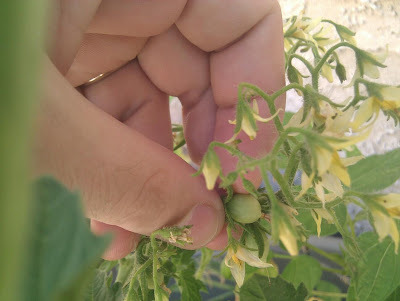 I’m pretty sure the problem was heat rather than water — but it’s been in the 90s most of this week too, yet I’m finally starting to see some tiny green tomatoes forming. 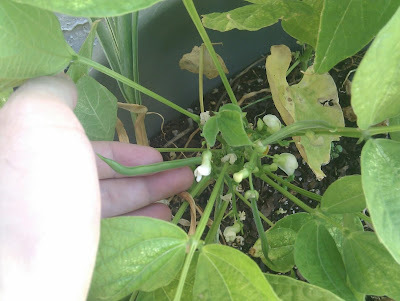 The green beans in my rooftop container garden were also dropping flowers like nobody’s business last week, but this week the first beans started to show up. These little guys are always intriguing — they start off as short, thin green stalks. If you’re lucky they keep growing longer and thicker until they look like the beans you find at farmer’s markets or grocery stores. If you’re not, they stay kind of stunted. Having gotten a pretty small crop of green beans in 2011, I decided to plant a larger number of seeds this year, and I’m planning on doing some succession seeding and adding another round of seeds soon. Green beans grow pretty quickly so I’m hoping to have time for at least 2-4 different rounds of plants this summer. Meanwhile, after growing the same basil plant in a small planter in my office window for the past three years, I decided to let some of its flowers bloom instead of cutting them off. After the flowers dry up, they leave behind seeds. I didn’t have much luck growing these seeds indoors — or even scattering them in the rooftop garden. So I decided to take a page out of nature’s book and just bury a few twigs snapped off the plant with their dried up seed pods intact. The result has been pretty great — basil is growing in the rooftop containers like nobody’s business. I’m a little concerned there may be too many plants growing in close proximity and competing for the same resources. But after they grow a little higher I might think about pruning out some of the smaller plants… and cooking them up with some pasta for dinner. Basil requires hot weather to thrive, so I don’t expect these plants to survive the winter. The plan is either to take whatever’s left at the end of the growing season and turn it into pesto or maybe dig up some and put it into a planter to bring indoors before the weather gets too cold. The plant in my windowsill isn’t looking as happy as it was a year or two ago.